Case Study 6. – 16th Century Building with 1850’s extensions. R & R Windows were contacted when a new owner moved into this period property. The customer was keen to restore the original windows which were a mixture of Sash and Casement windows dating from 1860 – 1920. The property was located only feet from a very busy main road. The house had partially open windows painted shut and the windows were very loose and rattled as traffic went by. The windows were in various states of disrepair. Heavily decayed sills, broken glass, over puttied glass and all of the windows were covered in layers and layers of black and white gloss. R & R windows were asked to fully restore and decorate all the windows including installing a modern draught proofing system. 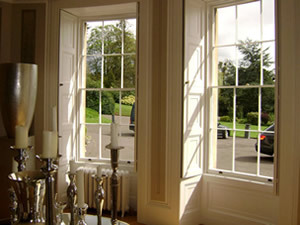 The sash and casement windows were ‘A’ typical of windows of this period. Rotting sills, lower box damage, failing construction joints and were heavily over painted with peeling flaky paint. The main repairs undertaken were critical to restore the window to their former glory. The sashes were removed and the sash boxes were fully stripped of all paint. The bare timbers were exposed and repaired by splicing new timbers, specialist resins and woodworm treatments. The sashes were also stripped and repaired including construction joints, bottom rails, meeting rails and glass replaced where damaged. The windows were reassembled, balanced and fully draught proofed using our unique Teflon system. 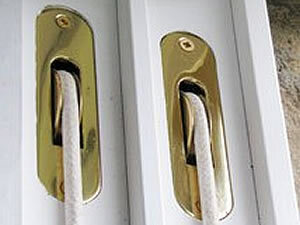 The windows were decorated in a gloss white to bring them back to the original look of that period. Once the renovation was completed the customer asked us to remove the secondary glazing as they were so impressed with sound reduction and how lovely the windows looked without it. All of the stages of renovation were captured on camera showing the before, during and after. The customer was delighted with the work undertaken and had the following comments to make about our service and quality of work. Another quality renovation by R & R. Look out for more upcoming case studies.